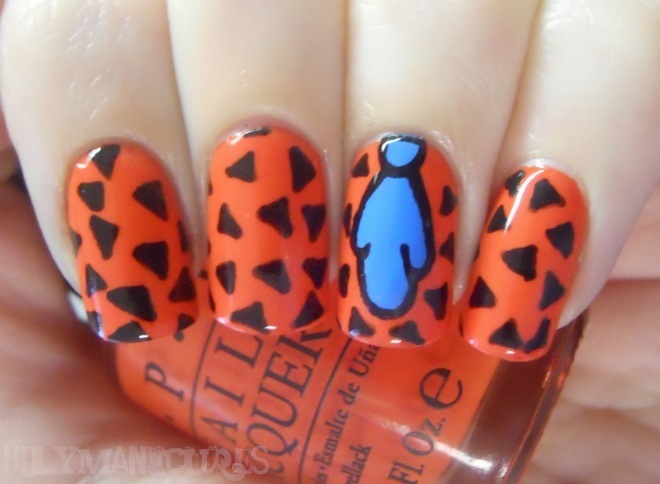 September 19, 2012 at 11:45 PM ET - Cute nails matching Fred Flintstone's famous outfit. The orange used is OPI Nail Lacquer, A Good Man-Darin Is Hard To Find. Black triangles were done with a Sally Hansen nail art pen, and the tie was done with Sally Hansen Brisk Blue, outlined with Wet n Wild Black Creme. Photo and instructions courtesy of Margaret at Holy Manicures.